High-quality window tint film is very impressive with how many amazing benefits it provides. 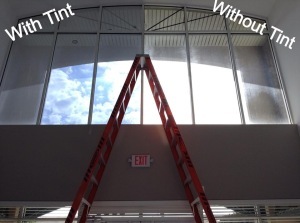 Over the years, window tint film application has advanced, leading to the development of new material types and techniques for installation. Curiosity provides consumers with the urge to find out how something works or how something is made – including window tint film. We get many customers who are curious about professional window tinting, resulting in a series of questions raised. To give our customers insight to some interesting aspects about professional window tinting, we’ve picked five inquiries to address further. 1. The Window Tint is applied on the Inside of the Glass. Many people wonder whether the window film is installed on the outside or inside. Almost always, the window tint is applied on the inside of a car or home. The film is cut to take the shape of the window and then carefully installed with the utmost accuracy. 2. Beware of Your Seatbelt Buckle. 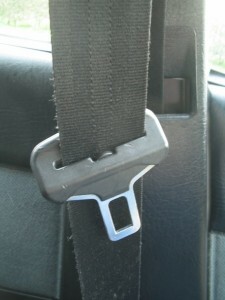 When drivers are in a hurry to get out of their vehicle, sometimes they sling the seatbelt off quickly, allowing it to hit the window. The impact of the metal hitting the film can cause it to chip. We recommend car owners who have window tint application be very cautious with their seatbelt to avoid chips. 3. The Window Tint Surface Can be Cleaned with Non-ammonia cleaner and a Soft Paper Towel. You should wait to clean the window tint for three days after it has been installed, to give it a solid chance to fully dry. Avoid using blue-colored cleaners because they usually have ammonia in them. Instead, opt for a vinegar-based or citrus glass cleaner. 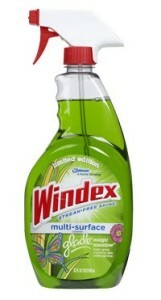 There are also cleaner products specifically designed for window tint film available on the market that work great. 4. Window Tinting Can be Conducted Even in Cold or Wet Weather. Today’s modern techniques for applying window tints allow installations to be conducted even in freezing conditions. In extreme weather conditions, however, the curing time may be extended. 5. Professional Window Tint Film is designed for Durability. High-quality window tint films are made with a scratch-resistant surface that protects it from everyday wear and tear. The quality of film and the precision of the tint installation ensures that there will be no peeling or bubbling later. Once the film is applied, it will last years and can be removed by a professional at any time, without causing damage to the glass. We welcome any questions from our customers, we know there is much to understand about window tint film, and we always strive to provide an answer. When investing in highly beneficial residential window tinting services in the Ft. Lauderdale, FL area, taking the time to learn about it proves its value. Don’t put just any sticky film on your windows – make sure you know its worth. As a top-of-the-line window installation company, we always keep up-to-date about the industry. This entry was posted in Blog on October 28, 2015 by admin. Almost everything seems energy efficient these days – washing machines, hybrid vehicles, air conditioners, gas furnaces and even light bulbs. But did you know that your windows can also be energy efficient as well? Nowadays energy efficient window replacements are available, but are, unfortunately, quite an expensive upgrade, with costs ranging anywhere from $8,000 to $16,000. But there is one cost effective solution that won’t break the bank and can be installed promptly: High-quality window tinting film! We’re not talking about do-it-yourself window tinting applications. A professional grade window tint will last for years without peeling or bubbling and provides energy efficiency. If you are skeptical, the proof is in the results – which is the significant reduction that the window tint installation will have on your energy bills. But how is it possible? Well, window tint film has the ability to reflect solar energy while it absorbs a different portion of it. In turn, the amount of heat that enters the room or vehicle is considerably less, which causes less power usage. Feeling comfortable in your vehicle or building’s atmosphere is not just a leisure! It keeps people healthy and happy. With a premium window tint application in Ft. Lauderdale, FL, you won’t need to jack up the air conditioning as much to achieve the comfort level you desire. The less energy you use, the less the energy bill will cost! Plus, having window tint installed costs a lot less than if you were to replace the windows with energy efficient glass. Depending on the shade of darkness you choose, window tint film can provide heat rejection of up to 85%. The film also is designed to reduce UV rays from the sun from penetrating through the windows. Some people may like to stick to the old-fashioned ways by still opting for windshield sunshades, blinds or curtains. While these tactics are still effective, they do not reject heat from entering the car or building and are, therefore, not energy efficient. For a significant decrease in the cost of your monthly energy bills, window tinting is one of the best options on the market. First-rate window tint film is also energy efficient for your vehicle as well. The effect of the car windows being tinted produces an outcome of a substantial decrease of fuel use. Since the window tint film provides heat rejection, you won’t need to turn your air conditioner on as much, which helps use less gas. Window tint film offers a convenient way to save money on gas. In Florida, where the temperature is warm all year round, window tinting is highly beneficial to drivers. Energy efficiency is not the only advantage that window tinting offers. As a matter of fact, window tint film also provides concealment, protection of furniture from fading, an enhancement in aesthetics and glare reduction. When it comes to using kilowatts, every dollar counts, which is why window tinting is a great option to achieve energy efficiency. This entry was posted in Blog on September 17, 2015 by admin. Why Hire a Professional Window Tint Service for Installation? Do-it-yourself (DIY) projects have been a popular trend in recent years, inspiring many individuals to take on tasks of their own through self-teaching. Window tinting application is one such project that can be done with a DIY kit. People who have the time and accuracy to install window tint to their car or window can save a bit more money than hiring a professional. However, hiring a professional to install the window tint instead can be worth the cost. When you attempt to install a window tint on your own, you risk dealing with film that is low-quality and flimsy. If you mess up the application the first time, it’s difficult to reapply it because of the film’s sticky adhesive. In addition, if you aren’t familiar with the local tinting regulations, then you’d have to read up on it to ensure that your application is legal. When you leave the window tint film application up to a professional technician, you don’t have to worry about all of the menaces that come with the job. If you were to put DIY installation and professional installation on a scale, the benefits of hiring a technician would outweigh the savings in the long run. Don’t forget, professional window tinting in Delray Beach is still much cheaper than replacing the glass of the windows entirely. If you still feel determined to install window tint on your own, here are a couple reasons why you should hire a professional instead. If you attempt to apply the film yourself and make a mistake, chances are you’ll have to buy another kit and do it all over again. But when you rely on a professional window tint service, you can be sure that the job will be conducted correctly, especially with computer cutting technology and state-of-the-art equipment. In the rare occasion that the technician makes a mistake, the company will most likely reimburse you or simply re-tint it. Unfortunately, you can’t get your money back for a window tinting kit that you failed to apply correctly. Most DIY kits do not come with the type of film that provides superb protection from the sun. If you want to reject heat, conceal valuables, block UV rays and reduce the glare from the sun, then you will need to apply professional-grade film. If you are only interested in gaining shade, then DIY would be an option, however, it won’t protect your furniture from fading. Choosing a window tint film to match your preference and needs can be overwhelming since there are so many available on the market. Let the technician do all the work for you in finding the right film for your vehicle, residential windows or commercial building windows. Whatever questions you may have can be answered by the expertise of an experienced installation company. How dark can your window tint legally be? When drivers are interested in having the windows tinted on their vehicle, this question is often raised, especially in relation to the darkness of the shade. Auto window tinting laws vary from state to state and Florida’s regulations have been in effect since 1991. The window tinting service that you opt for, such as John Barnes Window Tinting, should be knowledgeable in the window tinting enforcement policies put into place so that they can provide for their customers. Perhaps you want to install a high-quality window tint on your car to improve the exterior appearance, provide heat rejection or conceal valuable items. While those are all great benefits to having your car windows tinted, the last thing you want to do is apply a shade too dark that will cost you a ticket from law enforcement. Before you opt to install an auto window tint, it is important as a resident to be aware of Florida laws regarding the matter. Whether you are looking for a window tinting service in Lake Worth, FL, or in Miami, FL, knowing the state regulations will help you in choosing the right shade for your vehicle. Using our knowledge and expertise in the field, we’ve provided a detailed explanation of the window tinting laws of Florida. Visible Light Transmission percentage (VLT%) is how Florida measures the darkness of the tint; it’s the percentage of visible light that is permitted to enter the window through the film. On the back side and rear windows of the car, the tint must allow more than 15% of light in, according to regulations. The front side windows have to permit more than 28% of light in, while the windshield is allowed a non-reflective tint along the top above the manufacturer’s AS-1 line. The tint darkness requirement for SUVs and vans is slightly different from sedans. Like sedans, SUVs and vans have the same rule applied for the windshield and front side windows. However, for the back side windows and rear window, any shade of darkness can be installed from the top 6 inches of the window. If the back window is tinted, dual side mirrors are required on the car. Fortunately for drivers, there are no restrictions on the color of the window tint, although black remains the popular choice. When you have legal window tinting installed on your vehicle, it is required that you have the legal identification sticker on the inside of your driver-side doorjamb. If the window tint of the vehicle is needed for medical reasons, Florida laws allow exemptions for special window tinting shades. Finally, for window tints that contain metallic elements, there is a reflective restriction as well. The front side windows and back side windows cannot be more than 25% reflective. This entry was posted in Blog on August 11, 2015 by admin. 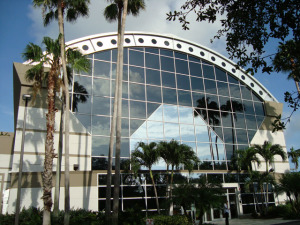 Does your commercial business in Florida have large glass windows? If so, then you probably know how annoying the sun’s UV rays can be and the effect it can have on your daily operation. If your employees are struggling to see their computers or screens due to the glare from the sun through the window or if the atmosphere seems too hot and humid, then having high-quality window tint film installed is your solution. A professional grade window tint can last for years and will not damage the surface of the glass. A highly trained professional will arrive on the premises to apply the film with the utmost precision. A quality window tint installation is highly beneficial for businesses in a variety of ways, especially in the area of Boynton Beach. It saves money for commercial companies by allowing for more efficient productivity, lowering the cost of energy bills due to less energy being used, and protects furniture from fading. Compared to blinds and curtains, window tint film does not collect as much dust, which provides the workspace with a cleaner environment. Window tinting also offers a quick fix to increasing the exterior appearance of the commercial building by providing a sleek look, similar to residential window tinting in Boynton Beach. In the state of Florida, professional-grade window tint film is proven to be the most cost-effective option for reducing the use of energy, according to a study released by the International Window Film Association (IWFA). It’s no wonder so many businesses invest in high-quality window tinting. So, when it comes to choosing the right window tint for the company, which shade film will work best in favor of the production? Different business goals generate different window tinting needs. To determine the best window tint match for the benefit of the business, take these tips into consideration. Since different window tints have more than one functionality, first you must decide what exactly your business needs. The question to ask is “What company goals do I want to achieve with the window tint installation?” Knowing what atmospheric obstacles the business needs to overcome will help you figure out which window tint is the best option. For example, if you want to reject heat from the sun but want visibility so that people can see in from the outside, a lighter shade window tint would be the ideal choice. If you’d rather have stronger protection from the sun so that the office furniture won’t fade, then you may want to go with a darker tint. Outdoor and indoor aesthetics are an important part of the company because the building represents the business as a whole. Make sure that you take into account how the window tint will look once it is applied onto the glass. High-quality heat rejection films can greatly improve the look of the business. Companies can achieve any look they want with a quality window tint. A limo-style window tint is available for those who prefer a dark, sleek appearance, while a very light tint would suit a laid-back presence. Before you decide on a window tint, ask the window tint company for a quote. Once you have the quote, you can compare and calculate how much can be saved on energy costs by using energy bill receipts. There are also tools available online that can help business owners and homeowners estimate their energy savings. This will provide a clear report of how the preferred window tint can benefit the building in the long run. Taking these few considerations into account will help you make the right decision for your business when choosing a window tint. Once the business goals are defined, the company will be able to get the most out of the window tint installation. This entry was posted in Blog on July 31, 2015 by admin. Do your windows let in heat from the sun and cause a glare to appear on your household appliances? Perhaps they do, but you are willing to live with it because you enjoy the view of the outdoors. Curtains or blinds could solve the issue, but they block your beautiful view and are time consuming to install. So, why not consider the modern alternative of high quality residential window tinting? Having window film installed in your home offers much more than just rejecting the heat and reducing the glare. We at John Barnes Window Tinting offer first rate window film installation for homes in the Florida area, including Boca Raton. Our window tinting services feature a fast and easy installation that is affordable for any residential budget. If you need an efficient solution that will protect your home without eliminating the outdoor view, window tinting is the answer. As the window tinting experts, we at John Barnes can list five major reasons why you should opt to have the windows of your home tinted. Tinting your windows is a great way to deter the view of outsiders from looking into your home. The film allows light to enter the house without letting the humidity in. 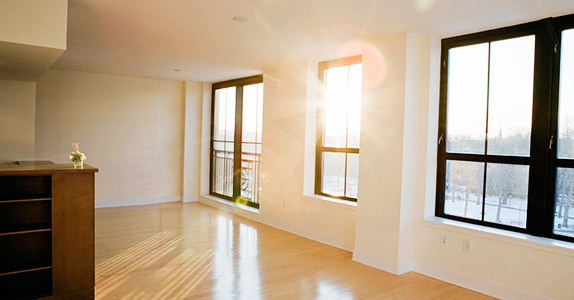 The light from the sun is still able to brighten the atmosphere of your home while harmful UV radiation is obstructed. The installation of window tinting is very affordable and doesn’t take long to install. Highly trained technicians can do the work for you, so you don’t have to! Plus, window film is temporary and can be removed, so it can always be swapped out with a new design when you prefer to update the room again. High quality window tinting isn’t only restricted to windows. You can also opt to have your bathroom glass tinted, such as the shower screen door or mirrors. Keep your bathroom nice and cool with the installation of window film, which also provides privacy at the same time! Because window film rejects the heat by up to 85%, your utility appliances won’t have to work as hard to maintain your comfort temperature. This reduces the costs of your energy bills, saving you more money each month. 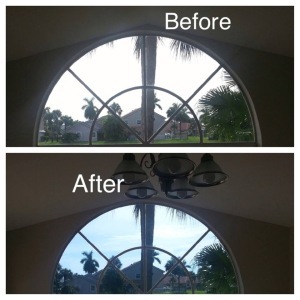 We at John Barnes Window Tinting offer high-grade residential window tinting services to residents of Boca Raton, FL, and the surrounding regions. Schedule an appointment for an estimate with us today! This entry was posted in Blog on June 18, 2015 by admin. Innovative solar technology has enhanced the ability of window tinting to reduce heat and block out the sun. In states such as Florida that are hot all year around, window tinting your vehicle can be very beneficial in a variety of ways. When you leave and walk out to your car to go somewhere, your car can be like a scorching oven, making it extremely difficult to get into. Vehicles that have their windows tinted with high-performance nano and carbon automotive films reduce heat from entering, which keeps the interior much cooler. Aside from staying cool, tinted windows also serve a variety of purposes. We at John Barnes Window Tinting point out the advantages of having your vehicle windows tinted. Rather than pay for an expensive alarm system, window tinting helps conceal valuable items in your car from thieves. Keep your gadgets away from the eyes of outsiders by tinting your car windows rather than spending the time to physically hide each item. Many people choose to tint their vehicle windows for aesthetic reasons. 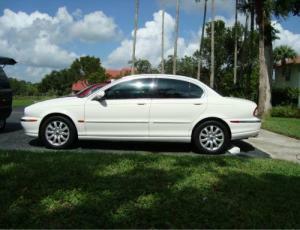 It provides the car with a more classy elegance, especially on older models or luxury vehicles. Ironically, window tinting can protect you from injury caused by shattered glass if you ever get into a bad accident. Quality window tinting film can hold the glass together and prevent it from spraying everywhere in the event of a crash. Keeping out the heat is a major function of having vehicle windows tinted, but window tinting also makes your car glare-proof when it comes to the bright sun. The sun’s glare can be blinding, making it difficult to see while driving. 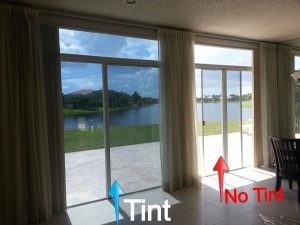 Window tinting solves this problem – the darker the shade, the less the glare will have an effect. If you are interested in having your car windows tinted, call us today for a free estimate. We do window tinting on cars, trucks, SUVs and more. Come visit us at our John Barnes Window Tinting shop in Lake Worth, FL – we cover all of Palm Beach County! 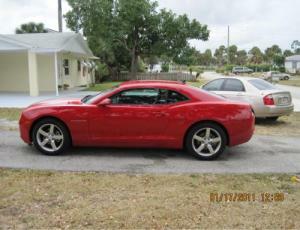 We also perform window tinting for residential and commercial buildings in Palm Beach, Broward and Miami/Dade Counties! This entry was posted in Blog on February 23, 2015 by admin. This entry was posted in Blog and tagged window film, window tinting on October 10, 2014 by admin. For business owners, there really isn’t anything better than improving a business and saving money at the same time. 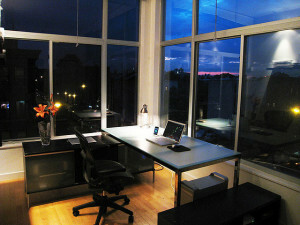 Window Tinting is one of the more unheard of ways to improve an office building and cut down on costs simultaneously. Installation of window film has helped thousands of businesses create a better workspace while trimming down on cooling costs year in and year out. This entry was posted in Blog and tagged commercial window tinting, window tinting on September 10, 2014 by admin. This entry was posted in Blog on August 5, 2014 by admin.